Sometimes you want something to happen so badly for such a long time, that when the moment finally comes where you get what you’ve desired for so long, you often don’t know how to react to the situation. 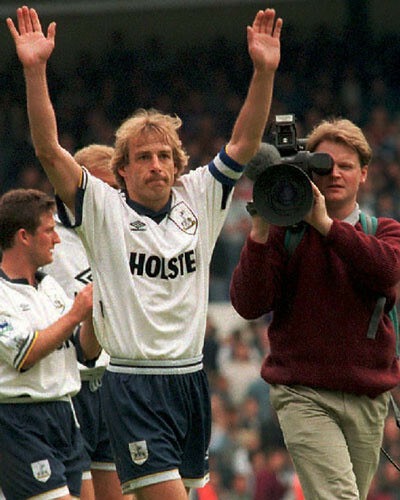 i'm not as excited about klinsmann appointment as i always thought i would be. It’s an odd feeling, especially when you’ve probably pictured the moment a hundred times beforehand and just knew that it would be one of the best things to experience. Instead, the anticipation built up while awaiting the moment completely exaggerates the eventual outcome. You’re left feeling confused and unsure of how to move forward. And right now, that’s precisely how I’m feeling about the end of the Bob Bradley Era for the U.S. Men’s National Team. I’ve been an ardent critic of The Robot since the very beginning of this blog, so I’m not going to waste my team rehashing all of the reasons I’ve been calling for his head all this time. Been there, done that. I don’t want to continue to cry about what Bob has or hasn’t done; it’s all in the past now. But with the national team having not really progressed in the five years since Bob took over from Bruce Arena*, whoever would eventually land in the hot seat next surely would face a number of issues with getting the program back on track to becoming one of the world’s elite soccer nations. * – Many will probably want to dispute this claim with arguments like “Bob beat Spain!” and “He made it to the final of the Confederations Cup!”. They have a point to an extent, as neither of those things had been achieved by previous managers. But the truth lies in the numbers. When Bobbo took over in December 2006, the USMNT was ranked #31 in the FIFA rankings. They’re ranking when he was fired: #30. Flawed as the rankings are, a +1 in ranking is not progress. And when Sunil Gulati took to the press stand on Friday and announced that long time managerial target Jürgen Klinsmann, someone I had repeatedly suggested should be awarded the post in the past, would be taking over the reigns… that same feeling persisted. I finally got who I wanted, but why don’t I feel like running out int the streets to wave my American flag and dish out a bounty of high fives to my neighbors? Well, aside from the fact that none of my neighbors probably know who Bradley or Klinsmann are… I just don’t feel all that excited about his appointment now. Klinsmann, of course, has been the USSF’s primary managerial target since the Arena era, and its common knowledge that he would have been given the job instead of Bob if the Gulati had been willing to give the German great the freedom he desired to completely control the men’s national program from the ground up… from personally choosing the youth team managers to actually coaching the Olympic team, all on top of his responsibility with the full men’s squad. Sunil and the USSF balked at giving up so much control, so Bob landed the job as plan “B”, this despite Klinsmann being the ideal candidate for the position. jürgen's playing resume is unquestionable. his managerial CV? not quite the same. As a former FIFA World Player of the Year, his experience on the pitch meant that the players will respect him. A prolific striker for Germany and a host of top European clubs (including Tottenham… which was the main reason I started to like the club in the first place), he could be a fountain of knowledge for the young and developing American strike force. At the time, he was fresh on the heels of a surprising and inspiring run with Germany to the 2006 World Cup semifinals, where he revolutionized the way Die Mannschaft utilized fitness, data and a renewed focus on developing youth to prepare and mange their team. Not only that, but Klinsmann is also the most Americanized of any qualified international candidates. After all, he is married to former American model Debbie Chin and has lived in California for well over a decade. Due to his Americanization, he’s also become very familiar with the soccer culture and set up, and has been a consultant for the USSF for some time. So after the USMNT were unceremoniously dumped from the World Cup by Ghana last year, general consensus and results alike seemed to convince the remaining holdouts that Bradley deserved the axe and Jürgen’s should finally get the nod. But, just as with the first set of negotiations, the US dropped the ball and decided to stick with plan “B”. Unsurprisingly, Bob and his team had a crap Gold Cup as well as decidedly poor showings in the friendlies in 2011. The “Golden Generation” of American players — Beasley, Bocanegra, Cherundolo, Dempsey, Donovan, Onyewu — are now at their peaks or beginning to show their age. Yet there’s no concrete or discernible “next generation” to carry the program into the future. To me at least, the USMNT appears to be in decline. Gulati must have felt the same way, thus explaining why he finally pulled the trigger on giving Klinsmann the keys to the car, the garage and the house. It’s what I and just about everyone else wanted forever, and yet I’m feeling some apprehensions now. In the time since Klinsmann was first identified as the primary managerial target for the national team, his coaching and managerial credentials have taken repeated hits. though successful at the german helm, löw (left) was likely more responsible for germany's resurgence than klinsmann. Despite his inspirational run on home soil during the 2006 World Cup, after stepping down from the German national team it became increasingly clear that much of the team’s leaps forward had been due to Klinsmann’s assistant coach (and now head coach) Joachim Löw. Though Klinsmann was charismatic and influential with regards to fitness and statistical analysis, DFB insiders all seemed aware that Löw was the tactical genius behind the team’s new offensive mindset. However, Klinsmann performance and popularity was still enough for him to be named as manager at a struggling Bayern Munich side in 2008. Though just his first club coaching position, the European giants allowed him some degrees of free reign at the club. Yet despite a respectable 25-9-9 record at the helm, his contract was terminated when the German power neglected to win the Bundesliga trophy and crashed out at the semifinals of the Champions League. Differences in philosophy between the board and the coach also seemed to be prevalent. Perhaps a bit harsh, but at Bayern, expectations are nothing short of uncompromising. Despite this setback, Jürgen’s name continued to be linked with a number of managerial posts around the game. Moves to Los Angeles Galaxy (who instead chose Ruud Gullit), Tottenham Hotspur (who stupidly chose Juande Ramos instead) and most consistently Liverpool (who probably made the right choice in reappointing Kenny Dalglish) all fell through. You’d be silly not to wonder why. And the last dent in Klinsmann armor came during an ill-fated role to revamp Toronto FC. Appointed as an “advisor” to the club on moves such as transfers and development, his impact has been minimal. Since taking the post in November 2010, Toronto have been leashed to the bottom of the table, lower than they had been prior to his appointment. So as each subsequent “failure” in Klinsmann resume came to light, I became less enthusiastic about his eventual appointment. I began to question is merits. Does he really have the know how to turn the national team around without Löw to lean on? We’re already one of the most fit national sides on the planet, and I think tactics and technical ability is where the USMNT needs to develop the most. He’ll need to find himself another tactician to work on his staff if he wants to have any success. Does he really know the American soccer landscape as well as we all hope and think? If so, you would have to think that his effect at Toronto FC wouldn’t have been negative. Is he really the right man for the job? If so many teams had passed over the Klinsmann before, maybe there was something they all saw that we haven’t. I don’t know the answer to any of those questions, and I feel like I’m disrespecting the guy for judging him before he’s had a chance to do a damn thing. I obviously want him to succeed in the job. And to be honest, there really aren’t any better options for the hot seat (maybe, and I stress maybe, Seattle’s Sigi Schmid). There’s no doubting that he faces an uphill task in turning this team around. That’s not to mention that Klinsmann is doing so with far greater expectations than were ever heaped upon Bradley. All I really know is that if Sunil, the USSF and the rest of the American soccer heads had completed the move to appointment Klinsmann back in 2005 instead of Bob, I wouldn’t have as many doubts as I do now. Maybe he would have failed like Bob did, maybe we would be a power. No one knows. Delaying his appointment by five years has done nothing but make me question the only real option we had in the first place.